Its not rare to find a shiny new talent do something interesting in a film. But this happens rarely enough that I find it exhilariting whenever I see it: a brand new talent with the weight of expected commercial success doing something non-commercial with the confidence of a near-auteur. Wake Up Sid is first-time director Ayan Mukerji's Coming of Age update for a generation of young Indians growing up on their parents' eco-boom affluence. Consider this: Ayan was 26 when he made this movie last year. He made it for Karan Johar's Dharma Productions. He made it with Ranbir Kapoor - a whip smart actor but with a non-existent track record at the box office at signing. All of the above were under intense pressure to deliver commercial success with this flick. What thrilled me to see is that Ayan did it differently - with the kind of super cool confidence that seems to say: I know what I'm doing. So what does Ayan do that is so different and hatke in this flick? Its his pacing. Its languorous, leisurely (its the antithesis of star Ranbir's other hit last year Ajab Prem). Early on the pace of the scripts mirrors WUS's titular character's life: meandering, laid-back, lacking a well-defined direction. Later as Sid begins to mature and become a more responsible person, the story develops plot inflections, if not plot points. All through the movie Ayan maintains a laid-back narrative, taking his time to play out his scenes and flesh out his characters. If you look at WUS closely, its full of standard movie archetypes and happenings. (Ayan is a self-confessed 'product of the 90s' and spent a lot of time watching Karan Johar's movies). But because they are handled so differently, they feel familiar yet different. Ok, Indian movies are full of these where the star is introduced in some epic way. But the opening shots of WUS - in which Ranbir struggles to focus on his studies - are playful and punched with nifty music (Shankar Ehsaan Loy scored the movie's songs). Thus they are rendered cute. But because the focus is on particular traits of Ranbir's character, they don't feel like exploitative fluff where a star is being introduced. Yes, there is one in every growing up movie. But in this one, instead of being an uncaring, aggressive brat, Sid is a zoned out, self-centered but caring, entitled and aware brat. Life comes easy to Sid simply because he has his Dad's money to spend and he has no qualms doing it (he answers the question 'what do you do' in the movie with 'I spend my Dad's money'). Because Ranbir nails the loose limbed body language of a slacker, Sid feels like a fresh, lovable spin on the stereotypical brat. Ayan hurdles over this necessary stereotype by doing the following. He refrains from making the friends over-cute. He doesn't make them slapstick funny (like in say Jaane Tu...) He gives them crises of their own to quickly fill them out (one has a weight problem, another is dumped by the love of his life). Easily the most annoying of all Hindi-film stereotypes, the Maa in WUS is played by Supriya Pathak with a ding-dong sweetness. Supriya gets to do all the stuff Maa's do in films, but she reins in the drama (even when being dramatic) and underacts (by filmi standards) the heavy emotional stuff. She's a Maa you can get behind. The actor who benefits from Ayan Mukerji's willingness to amp down the theatrics is Anupam Kher, who plays Sid's hugely successful Dad. Forced to pay the bills in countless roles that are well beneath his talent, Kher is able to deliver the emotional payload in two key scenes without once acting out of bounds. (Its the same Kher who dazzled us in A Wednesday). These scenes ground the movie in its slacker vibe. Sid finally finds his creative redemption by turning his hobby as a photographer into a profession via an internship. Anyone who watches movies can see that one coming for a mile in the movie. But Ayan rescues this eye roll worthy piece of writing with an associative loopback (Sid likes to photograph his feet against backdrops) in the end that is entirely charming. You can't have an Indian movie without La Familia and lots of emotional, tear-jerker scenes involving one or more members of the family. In WUS, there are four key scenes involving family. All of them are standard scenes, but played differently entirely by tuning the dialog (and amping down the theatrics). The actors get one line to speak where typically there would be three. More importantly they speak those lines at civilized, as opposed to ear-splitting, decibels. If there is one formula that Bollywood can bottle, its this one. If done right, its a near sure fire way of connecting with younger audiences. Ranbir and Konkana get love out of the way early by talking about it and deciding they are not made for each other. This paves the way for a solid friendship even though you know where its going to end up. But in WUS, its a platonic friendship on steroids because Ranbir and Konkana spend the better part of the movie living as roommates and doing all kinds of things (dates! cooking! arguments! laundry!) together that a couple would. A misunderstanding, followed by sulking and finally LOVE! Every romantic movie has one of these honkers - a crisis that is precipitated due to some lame reason, then a period of sulking and finally forgiveness. In WUS this feels fresh entirely because Ayan keeps this period short. In fact, the end is the only part of WUS that feels hurried, but by then its just the right pace. I have SO MUCH to say about this film, but here's the most important: This is hands down the best review I have read. You are heads and shoulders above other so called filmi journalists and manage to give this review a totally fresh spin. Loved this movie...has something for everyone. Liked the "tough love" approach that the parents implement. Loved that "failure" is discussed in areas of love, respect, parenting, career and of course weight. Loved that the movie reflected many things I went through in my early twenties. Aah Aspi. Thanks for talking about WIS. Spent the better part of last year in hibernation from TV land. Caught WIS recently and then watched every award show that came after hoping to see it get one good award. None came, this feels so appropriate. Almost feels like 2008 with MKMM reaching new heights of awesomeness and Himesh 3.0 and Rahul Mahajan once again on TV screens. Mind Rush and Anon thank you yaar. Finally a review of one movie I watched(and loved) in the recent times. I loved the scene where koko recommends Ranbir to the lead photographer and the scene after that.Simple writing,subtle expressions and there you have a scene that blends so well into the rest of the movie without making Ranbir feel obliged to express his gratitude,leading to an emotional monologue.Isn't that nice? I agree with you about the climax.Yeah,they could have taken a couple of mins more to finish telling the story of Sid and Aisha. Nevertheless,it's an adorable movie. Hey Saritha. I liked how the rickshaw accidentally ends up going back to Sid's old house and how he ends up going in on a whim. It's well thought out and works. It didn't hurt that I have suffered and still suffer from the hangover of an over efficient mom. I struggle to keep my house clean and organized since leaving her fold and its a battle I am still kinda losing. Sid, I feel you man, except movie montage cleaning is just so much easier!! Can you fold a fitted sheet? That parting egg gift was cute, no? leera, are you single? Hard to believe but if you are, I'd like to ask you out. Hooked, booked and cooked, sid to another 20 something slacker like me and you. We should all start a club though. First order of business - How to fold fitted bedsheets/Air mattress covers. Hey any sister or cute friends who hate doing laundry as much as you? Sid, what happened to Koko - she dumped you what? Achhee bhali to thi - washed her kurta one too many times? I skipped out on seeing this movie when it played near me and then regretted it. Luckily Netflix pulled through. I absolutely loved it. It struck me a bit as the new generation's Dil Chahta Hai, but at the same time it felt fresh, understated, and so believable. It also really sold me on Ranbir; I hadn't been a huge fan of his but now I'm game to see anything he's in. Great review! Me and my family ended up having a Ranbir Kapoor, weekend, quite on a whim,.. but these are the movies we watched. I didn't mind Saawariya, but it was the theater movie combo that I liked. Sort of, watching the movie Chicago instead of the Broadway. It had similar flavor, Ranbir Kappor wasn't the one that stood out. 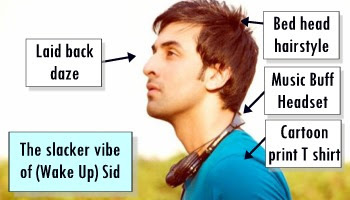 But, in each of the movies above Ranbir Kapoor stands out as a actor who can take on different roles. I agree with B'bay Talkies, now I will be watching his career unfold.Will be cubby hole himself into one of he looks of will he keep up with his versatility..we will see Raj Kapoor ka poota kaisa name kara gaa !! Oh! Thank you for the love all of you. I am back after two days of navel gazing. Its so refreshing to see people like me for who I am (a slacker) rather than what I have (a lot of money). Koko is not with me anymore. I got distracted once while saying 'I love you' to her and she stormed off. Kya yaar? No one gives a man space these days. Never mind. There are lots of wonderful girls around who are not obsessed with organizing all the time. And who are not Leera, I mean taken. God bless, love to all. Keep your rockets in your pocket.